Like crocodiles, snakes also suffer from a prevalence of “big fish” stories and over-exaggeration in the internet era. In fact, it is very difficult to measure how large actually a snake is, especially if it’s really big. So, how big are the largest snakes actually? Danish advertising agency Bates Y&R created the illusion of a huge snake crushing a Copenhagen city bus as part of a campaign for the city zoo. The remote location of the big snakes’ habitat has historically made locating, capturing, and returning specimens difficult. A big snake’s skin can stretch substantially, increasing its size by more than 50% if stretched during the tanning process. Reports without physical proof are almost always dubious (in fact, simply false) from non-scientists: such individuals may at worst be more interested in promoting themselves or telling a good tale, or at the least may not be sufficiently trained in proper measurement methods. Observational reports of animals which were not captured are even more dubious, as even trained scientists often substantially overestimate the size of big snakes prior to capture. According to the Guinness Book of World Records, this species has been perhaps subject to the most extreme size exaggerations of any living animal. It is also difficult to argue a maximum possible or plausible size, because snakes are known to continue to grow throughout their lives. Older reports in particular could include individuals which, in times of less pressure from humans, lived longer lives and thus reached greater sizes. Numerous historical accounts of the big snakes are reported, often of improbable sizes. Several zoologists (notably Henry Walter Bates and Alfred Russel Wallace, among others) note rumors of snakes beyond 30 or 40 feet (9-12 meter) long, but in each case, their direct observations were limited to snakes of approximately 20 feet (6.1 meter) in length. To prove the point of overestimating, in Guyana in 1937, zoologist Alpheus Hyatt Verrill asked the expedition team he was with to estimate the length of a large, curled-up anaconda on a rock. The team’s guesses ran from 6.1 to 18.3 m (20.0 to 60.0 ft); when measured, this specimen was found to be 5.9 m (19.4 ft). So, what is the size of the largest snake? Medusa: the longest snake ever in captivity. Photo: Guiness World Records. 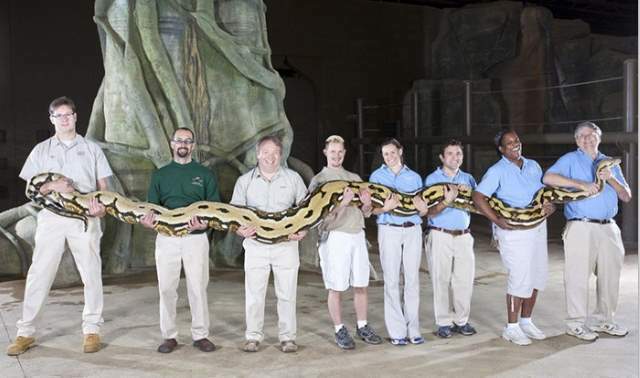 According to the Guinness World Records Book, at 7.67 meters (25 feet 2 inches) long, Medusa, a Reticulated Python owned by Full Moon Productions in Kansas City, Missouri, USA is the longest snake ever in captivity. The 8-year-old, 158.8 kilogram (350-pound) reptile is primarily kept coiled up in a nook in a haunted house attraction (The Edge of Hell) with its cavernous turn-of-the-century brick warehouse. Medusa’s primary diet consists of a combination of rabbits, hogs and deer, served to her every two weeks. Medusa, the longest snake in captivity. Photo: Guiness World Records. 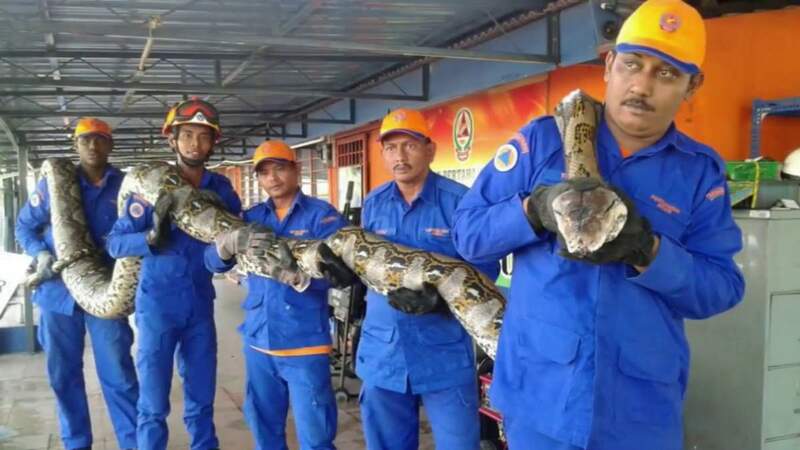 Members of Malaysia’s Civil Defence Department hold a python believed to be 8 metres long and found on Penang island. Photograph: Herme Herisyam, Malaysia’s Civil Defence Force. In April 2016, a huge python caught on a construction site in Penang island, Malaysia. According to the Malaysia Civil Defence Department authorities, it was 8 meter (26.2 feet) in length and about 250 kg (551.15 lb) in weight. It was longer and heavier than Medusa (Guinness World Records Book still recognizes Medusa as the longest snake ever in captivity). It was a pregnant female. Unfortunately, the snake died three days after being captured. She first gave birth, then died. The longest snake in captivity, Medusa is a Python reticulatus, also known as the (Asiatic) reticulated python, a species of python found in Southeast Asia. Adults can grow to 6.95 m (22.8 ft) in length (so Medusa is an exceptionally long specimen) but normally grow to an average of 3–6 m (9.8–19.7 ft). It is a great swimmer, has been reported far out at sea and has colonized many small islands within its range. The specific name, reticulatus, is Latin meaning “net-like”, or reticulated, and is a reference to the complex color pattern. Like all pythons, they are normally not considered dangerous to humans. Although large specimens are powerful enough to kill an adult human, attacks are only occasionally reported. Despite this, Python reticulatus has been responsible for several human fatalities, in both the wild and captivity. A Green anaconda (Eunectes murinus) at the New England aquarium. Eunectes murinus (green anaconda) is not the longest, but the largest, heaviest, and second longest (behind its cousin, the reticulated python) known extant snake species. Its Latin name derived from the Greek ευνήκτης meaning “good swimmer” and the Latin murinus meaning “of mice” for being thought to prey on mice. A member of the boa family, the green anaconda can reach 5.21 m (17.1 ft) long. More typical mature specimens reportedly can range up 5 m (16.4 ft), with the females, at around a mean length of 4.6 m (15.1 ft), being generally much larger in adulthood than the male, which averages around 3 m (9.8 ft). Weights are less well studied, though will reportedly range from 30 to 70 kg (66 to 154 lb) in an average-range adult. It is the largest snake native to the Americas. Although it is slightly shorter than the Reticulated python, it is far more robust: the bulk of a 4.5m green anaconda would be comparable to a 7.4m reticulated python (on average, the record holder Medusa above is an exception). Reports of anacondas 35-40 feet (10.6-12.1 meters) or even longer also exist, but such claims need to be regarded with caution, as no specimens of such lengths have ever been deposited in a museum and hard evidence is lacking. A $50,000 cash reward is offered for anyone who can catch an anaconda 30 ft (9.1 m) or longer, but the prize has not been claimed yet. The longest (and heaviest) verified specimen encountered by Dr. Jesús Antonio Rivas, who had examined thousands of anacondas, was a female measuring 521 cm (17.09 ft) long and weighing 97.5 kg (215 lb). Gigantophis garstini was a giant prehistoric snake which may have measured more than 10 metres (33 ft), larger than any living species of snake. 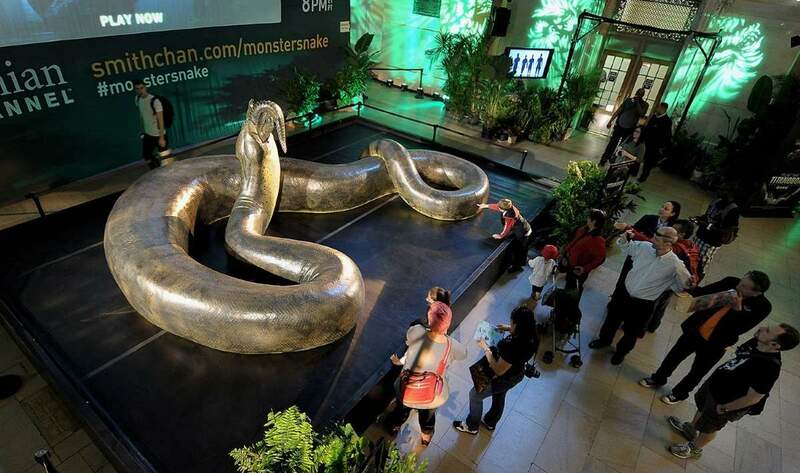 Before Titanoboa was discovered in Colombia in 2002, it was regarded as the largest snake ever. Gigantophis lived approximately 40 million years ago in the northern Sahara, where Egypt and Algeria are now located. The snake was named after Egyptian Under Secretary of State for Public Works, William Garstin. The species is known to scientists only from a small number of fossils, mostly vertebrae. Life-sized model of Titanoboa devouring a dyrosaurid, from the Smithsonian exhibit. Titanoboa, meaning “titanic boa,” is an extinct genus of snake that lived approximately 60–58 million years ago, during the Paleocene epoch, a 10-million-year period immediately following the dinosaur extinction event. The only known species is Titanoboa cerrejonensis, the largest, longest, and heaviest snake ever discovered. By comparing the sizes and shapes of its fossilized vertebrae to those of extant snakes, researchers estimated that the largest individuals of T. cerrejonensis found had a total length of around 12.8 m (42 ft) and weighed about 1,135 kg (2,500 lb; 1.1 long tons), which supplanted the previous record holder, Gigantophis. After developing coordinates for individual Titanoboa vertebrae, Head and Polly used the model to position them in their correct spinal location and determine Titanoboa’s length.The team published its first results in Nature in early 2009, saying Titanoboa was between 42 feet and 49 feet long, with a mean weight of 2,500 pounds. The Cerrejón vertebrae were all of comparable size even though they were from different animals. With Titanoboa, enormous was the rule, not the exception. Several researchers disagreed with the above estimate. For example, a 2009 study in the journal Nature applying the mathematical model used in the above study to an ancient lizard fossil from temperate Australia predicts that lizards currently living in tropical areas should be capable of reaching 33 feet, which is obviously not the case. In another critique published in the same journal, Mark Denny, a specialist in biomechanics, noted that the snake was so large and was producing so much metabolic heat that the ambient temperature must have been four to six degrees cooler than the current estimate, or the snake would have overheated. According to some websites, a giant 10-meter (33 feet) long anaconda found at a construction site in Altamira, Pará in northern Brazil. The monster snake is also 1 meter (3.2 feet) in diameter and weighs 400 kg (881.849 lbs). If it was true, it’s the largest snake ever recorded in history. But come on, an anaconda almost as big as Titanoboa? It seems the snake hasn’t been properly authenticated, and it is much larger than any other accurately reported sighting. Note that they used the forced perspective technique in the photo below. 33-feet (10-meter) long Brazil anaconda. Note that they used the forced perspective technique in the photo. The hoax has started by some tabloid papers’ websites like dailymail.co.uk, thesun.co.uk, mirror.co.uk, dailystar.co.uk, etc. They posted the video above and filled the internet with anaconda 10 meters and 400 kg. You can read the whole story of the hoax on ellinihoaxes.gr (you may want to translate the page into English). According to the site, the hoax originally produced by e-farsas.com , who managed to fool the whole world. The company that manufactures the dam also noticed that the video is not taken in the place where Belo Monte Dam is being constructed. 100-feet-long snake (fake image). According to the British tabloid paper Daily Mail, this photo has taken in Borneo. Another 100-feet-long snake. 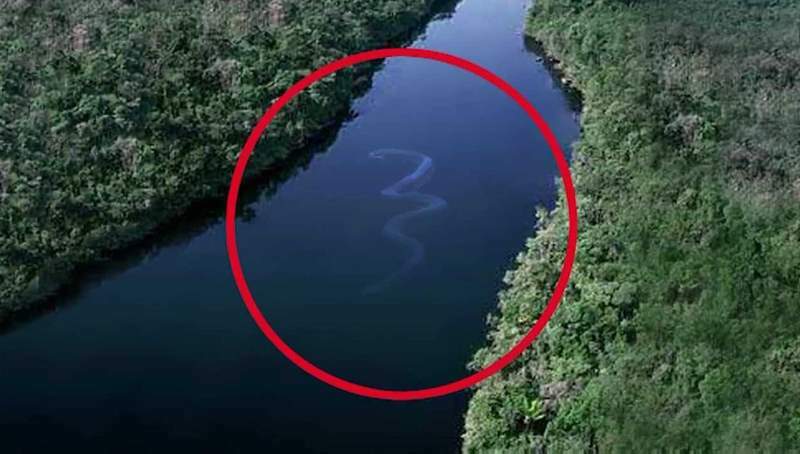 According to the British tabloid paper Daily Mail, this obviously fake image shows something snake-like in the water off a remote village. Another 100-feet-long snake? Oh yes, definitely. The last section has a mistake, the critique that Head et al. (2009) received was about the temperature they estimated for the time Titanoboa lived, it was not about their size estimate.